With SeaDream I (and sister SeaDream II), SeaDream Yacht Club has managed to carve out a unique niche for itself. SeaDream, created in 2001 when a former Seabourn honcho acquired Cunard's pair of Sea Goddesses, is the most genuine small-ship ultimate-flexibility cruise experience in the industry. A lot of cruise lines, particularly luxury ones, market themselves as offering land resort-like flexibility, but SeaDream really delivers on that promise. What was most distinctive about our voyage on the 4,260-ton, 110-passenger SeaDream I, a Caribbean cruise, wasn't only that we were sailing on a smaller, more intimate ship with consistently top-notch cuisine and service, but also the ambience. Playing with its "yacht club" theme, dress was always informal (and stylish) and the onboard atmosphere was casual -- there were no force-festive "group" activities. SeaDream I itself is a lovely ship; it looks nothing like it did uring its moldering days as a Sea Goddess ship. Two major distinctions -- and two reasons (as if we needed them) why we're ready to sail again -- are its sports platform that opens off the back, with plenty of sports toys (from kayaks and a Sunfish sail boat to water skis and even a Jet ski! ), and its Balinese beds. Clustered around the smokestack on the ship's top deck, these double-sized uber-comfortable loungers are set on a platform above the railing and are great spots for everything from sunbathing to sunset-watching. Another major plus? The ship truly adheres to one of the industry's most all-inclusive philosophies. Everything from cocktails to caviar and from the golf simulator to bikes for use in port is tabbed in the fare, as are gratuities. We'll offer one potential downside to the ultra-small-ship SeaDream experience -- and this is meant more as a heads-up than a warning. Because of both ships' small size, they've become quite ideal to folks, from companies to incentive groups to (really) large gaggles of family and friends, and as such are chartered more frequently than other ships. And there is a potential that individual travelers could get bumped, even from confirmed voyages. The good news? 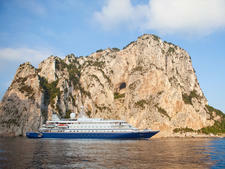 The company never charters both ships at the same time, so travelers can usually transfer bookings. For the most part, passengers we met might otherwise have been sailing on Silversea, Seabourn, Regent Seven Seas or Windstar but were looking for an experience that was more laid back without sacrificing service, cuisine and comfort. Folks hail primarily from North America and Europe; age averages in the 40 - 60 range. Passengers tend to dress in varying levels of country club casual, whether it's poolside, at lunch in the dining room or at dinner. All tips are included in the cruise fare.